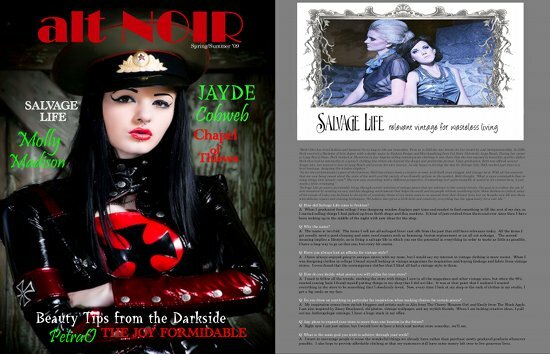 Salvage Life was just featured in Alt Noir Magazine which is a specialty independent online fashion magazine. Since you can't read it in the picture, I printed the interview questions and answers below. If you would like to download the whole free magazine, click the above link. Q: How did Salvage Life come to fruition? A: When I graduated from college I was designing window displays part time and needed to find something to fill the rest of my day, so I started selling things I had picked up from thrift shops and flea markets. It kind of just evolved from there and ever since then I have been waking up in the middle of the night with new ideas for the shop. A: The name is two fold. The items I sell are all salvaged lives; cast offs from the past that still have relevance today. All the items I get usually need a good cleaning and some need repairs such as hemming, button replacement or an all out redesign. The second meaning implies a lifestyle, as in living a salvage life in which you see the potential in everything in order to waste as little as possible. I have a long way to go on this one, but every bit counts. Q: Have you always had an affinity for vintage style? A: I have always enjoyed going to antique stores with my mom, but I would say my interest in vintage clothing is more recent. When I was designing clothes in college I found myself looking at vintage magazines for inspiration and buying findings and fabric from vintage stores. I even found that the contemporary clothes that I liked all had a vintage style to them. Q: How do you decide what pieces you will utilize for your store? A: I used to follow all the trends, stocking the store with things I saw in all the magazines and other vintage sites, but when the 80's started coming back I found myself putting things in my shop that I did not like. It was at that point that I realized I wanted everything in the store to be something that I absolutely loved. Now, every time I look at my shop or the rack of clothes in my studio, I get a big smile on my face. Q: Do you draw on anything in particular for inspiration when making choices for certain pieces? A: My inspiration comes from stylish bloggers and artists such as Alix from The Cherry Blossom Girl and Emily from The Black Apple. I am also inspired by Zooey Deschanel, old photos, vintage wallpaper, and my stylish friends. When I am lacking creative ideas, I pull out my Anthropologie catalogs, I have a huge stack in my office. Q: Any plans to expand your store to more than one location in the future? A: Right now I am just online, but I would love to have a brick and mortar store someday...we'll see. Q: What is the main goal you wish to achieve through your work? A: I want to encourage people to reuse the wonderful things we already have rather than purchase newly produced products whenever possible. I also hope to provide affordable clothing so that my customers still have some money left over to live generous lives. Awesome!! I loved reading about how your shop got it's name. I'm sooo jealous you got to design window displays! No wonder your pics are so amazing! Great job, Beth! So proud of you. Hope your figuring out the balancing act of business and family. congrats on getting published! if i ever come back home, i'm comin to your shop! !